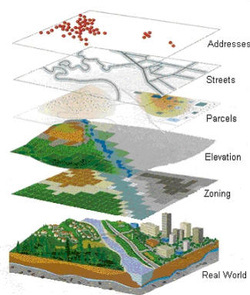 A geographic information system (GIS) integrates hardware, software, and data for capturing, managing, analyzing, and displaying all forms of geographically referenced information. GIS is computer software that links geographic information (where things are) with descriptive information (what things are). Unlike a flat paper map, where what you see is what you get, GIS can present many layers of different information. a way that is quickly understood and easily shared. Click here to learn more about GIS. Click here to view the Rock County GIS.